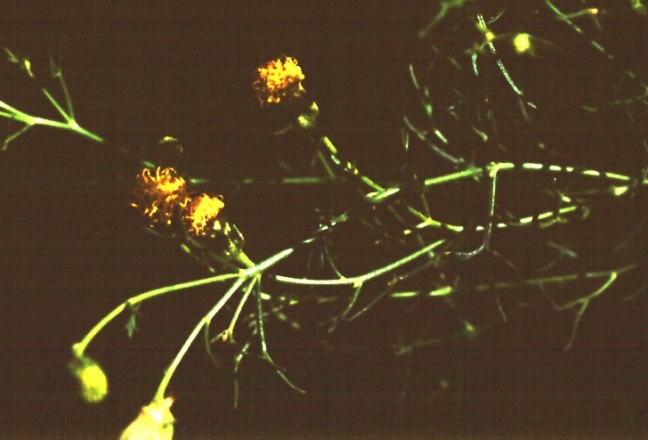 Description: Perennial herb from a woody base; stems many, to 30 cm long; leaves many, mostly deeply and narrowly three-lobed, somewhat cruciform; flower heads terminal, solitary or in small clusters, somewhat bell-shaped; involucral bracts lance-shaped, about 4-5 mm long; ray flowers absent; disk flowers 30-40, yellow, about 3 mm long; achenes silvery, usually with 2-3 stout awns at the summit. Flowers June to September. Similar Species: This variety differs from var. staurophylla by the absence of ray flowers and achenes that are silvery instead of dark brown to black. Distribution: New Mexico, Sierra and Socorro counties, northern San Andres Mountains. Habitat: Crevices in limestone cliffs, usually on protected north and east exposures at about 1,950-2,150 m (6,400-7,000 ft). Remarks: Endemic to the north end of the San Andres Mountains and locally common within its limited habitat. Conservation Considerations: Occurs on cliff sides in an area that is off-limits to the general public. Therefore, its habitats are relatively inaccessible. Current land management practices do not appear to adversely affect this plant. Niles, W.E. 1970. Taxonomic investigations in the genera Perityle and Laphamia (Compositae). Memoirs of the New York Botanical Garden 21:1-82. Powell, A.M. 1969. Taxonomy of Perityle section Pappothrix (Compositae: Peritylinae) Rhodora 72:58-93. Todsen, T.K. 1983. A new variety of Perityle staurophylla (Asteraceae) from New Mexico. Madroño 30:115-117.